oh, dear! mario cart is VERY addictive!!! I love the greens. Mario Kart is awesome. Just don't get and I repeat don't get Animal Crossing -City Folk. Oh my heavens........so addicting. While I'm playing the wii, the sewing machine is calling my name, and while I'm sewing the wii is calling my name. It's a constant battle. Hope you enjoy, and thanks for sharing. Mario Cart is great. Nobody will play with me because I stink at it, but it is still fun. I am so tempted to make a nasty Wii joke, but I will be good. what a surprise to see my "sad" fabrics here! I'm glad you like my mix. quilt bees are very fun - I am psyched to see all the awesomeness my swapsters have been making! Inspiration is a wonderful thing. Those green silks inspired me to find a couple of silks to add to my little blue cottage quilting bee fabrics (I picked the birds - it was the peoples' choice, although Katie Jump Rope got my vote!). As for those sad fabrics - *sigh* wonderful, I love them so much. I love your blocks and the palettes that you are showing. I can't believe that you haven't worked with batiks. Aren't they wonderful?? Oh and Collaborative Quilting, isn't that the most inspiring bright and beautiful book? I have a copy and frequently find myself weeding through it. Love your green block...and the color palettes are very inspiring (my favorite is the orange and gray). We are addicted to the Wii as well, but I can't beat the hubby at MarioKart! As usual, I love your quilt blocks, and thanks for pointing out more places to look for inspiration! And watch out for Mario Kart--it's a daily occurrence around here, and my son (he's 5) rocks it! Great blocks! I especially love the red/grey ones! The wii looks like a lot of fun. 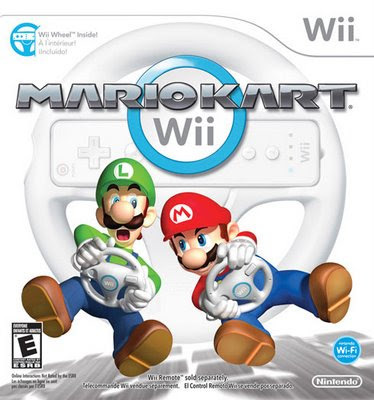 mario cart for the wii is sooooo much fun! i spent a lot of time playing it over christmas break. i didn't get any better at it, though. Love your top green block. the fabrics are fun- and the design is great. Lots of mini blocks all rolled into one! I love the blocks! They are wonderful. I have heard that the WII is very addictive and has resulted in many a quilters demise! Sounds like fun! we went to best buy. i saw the wii...then i saw mario cart. so here i was this 26 year old having the grandest of times...and there were TWO 12 years old waiting to play. loser i am...and proud of it!!! Yup, that Wii will compete with your sewing machine! Just sending a shout out to you. I've enjoyed your blog and how fun to have a man in our cottage quilting bee. LOL. Adina is cracking me up. You do remind me of him now that she said that! I am totally jealous of Mario Cart I am still miss playing the original Mario Bros. that was the BEST! Those greens by mommaandbeyond are GORGEOUS, but I am a green girl. Love it. Turns out that mommyandbeyond is my friends cousin, this world can be so small.